The pace of a game can be dictated by several things. Teams without possession can dictate tempo by applying pressure on the player with the ball. This can cause the player to lose the ball or make quick movements to evade this pressure. If pressure is continuously applied, then the team in possession may move the ball about much quicker than they may want to, which usually forces them into hurried passes which may go astray. Most young players don’t even consider the pace of the game as something they can take advantage of. Every game has its highs and its lull-periods and good coaches recognize when these shifts occur and can make adjustments to their advantage. In your meetings, introduce your team to the concept of pace/tempo and let your players know that they have the power to create it during the game. If you have a team that can impose their tempo on the other team then you’ll be rewarded. It’s impossible to play soccer at sprint pace for an entire game. The ability to change the pace of the game is a difficult tech­nique to acquire and only really good teams do this well. The fact that it’s difficult should not stop you from practicing it because even a slight improvement in this phase of the game can pay off big. 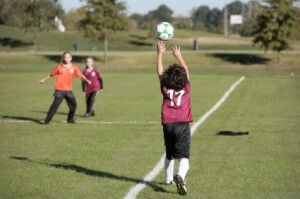 Most players under-16 and younger don’t even consider manipulating tempo as part of their game. Elite players realize that changing speeds, however, pays big dividends. Here’s an aggressive soccer drill that involves practicing pace and pressure. Play three-against-two in a twelve yard square area. The idea is for the three players to pass the ball amongst each other while the two opposing players try to take it away. However, simple passing is not the total focus of this drill. On your whistle, have players pass the ball quickly and then slowly. This change in speed of passing is a test to slow down the tempo. The two opposing players should try to steal the ball and should not change their speed in doing so. The three players will be under a lot of pressure. The less experienced the players, the quicker they’ll lose the ball because they’ll not have the ability to use the spare player quickly enough in order to slow the game down to a more comfortable pace. Experienced players will adapt them­selves more quickly which will leave the spare man time to put his foot on the ball and slow the pace down. They’ll also cultivate the ability to hold the ball by screening in tight situations. Working on these principles, the team not in possession will dictate the pace unless the team with the ball creates space and uses the spare player effectively. So, on a whistle or a shout, the ball must be passed around at a much faster rate until another signal is given at which time your players are to slow down to a jogging pace. The quick passing should be played first-time if possible. The defender will try and create pressure and their own tempo while the three passers will try to do the same. When the drill is over, discuss with your players how the pressure and speed of the game changed and why it changed under different circumstances. They’ll quickly gain an understanding of the value of pace and how they can control it. Remember, it all comes down to space. Some teams give it to you and other teams will pressure you and make it tight. Whatever happens, look for it and use it efficiently, other­wise you’ll be forced to play at a pace dictated to you by the other team.